UDM Downloads > BigSpeed Peer-to-Peer SDK! BigSpeed Peer-to-Peer SDK is a set of two COM components (Agent and Hub) that lets you set up a virtual private peer-to-peer (P2P) network for secure file sharing and messaging. The transfered data are scrambled using on-the-fly 128-bit AES encryption, without need of SSL certificates. NAT traversal is implemented by using TCP hole-punching technology. The security is provided in two different modes: symmetric encryption with shared secret key and asymmetric encryption with 1024-bit public/private keys. The hub is responsible for keeping information on and authentication of online peers. All peers connected to a particular hub build a single private community. Each agent acts as both a client and a server at the same time. Fine grained access control is realized by a user-oriented permissions. They grant access control privileges to system resources and services in a flexible and secure manner. Two different kind of instant information can be exchanged between peers: alert and chat messages. In addition to standard FTP operations, such as upload, download, rename, delete, etc., the SDK also offers several advanced features. The broken file transfers are resumed automatically (if enabled), with MD5 integrity checking. The agent is able to run search operation on the peers. The server module is able to perform file compression and decompression by a request from the remote client module. There is an option to compress on-the-fly the outgoing data before encrypting, which may reduce greatly the transfer time for large files. BigSpeed Peer-to-Peer SDK utilizes an elegant event-driven paradigm for easy integration into Windows applications. A special attention is paid to provide responsive user interface while avoiding multithreading problems and maintaining maximum bandwidth efficiency. 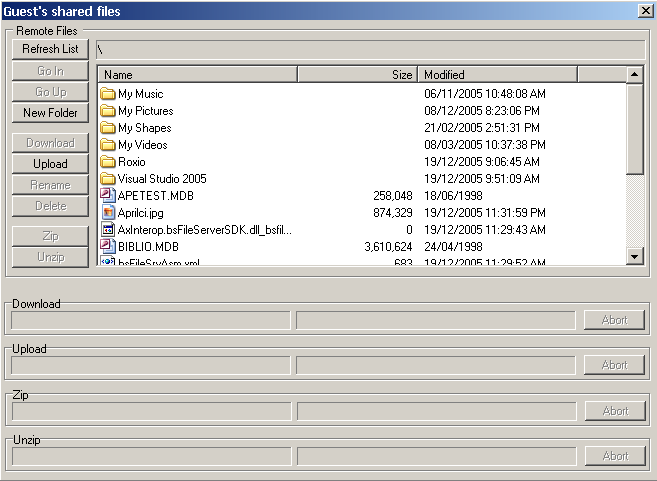 Sample applications are included in VB .NET, VB 2005 and Delphi 7.